*NEW* Ultimate security CEN 6+ super heavy duty closed-shackle padlock with extreme security NW4 New Wave dimple cylinder and Stormproof cover. Ultra heavy duty padlock. This is indeed the world's strongest production padlock. High tech key and cylinder with active elements. See alternative listing for the R1 cylinder variant. 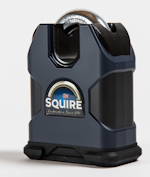 10 year guarantee from Squire. Sold Secure Motorcycle Gold. Please note: This is an ultra high security lock that weighs 2.2kg for the lock on its own! Not recommended except for extreme situations where the ultimate deterrent is required. Suitable for Protector 16mm and 19mm and other high grade chains. Not suitable for use with the Anti-Pinch Pin. NW4 cylinder not available keyed-alike. *NEW* Ultimate security CEN 6+ super heavy duty closed-shackle padlock with Stormproof cover. Ultra heavy duty padlock. This is indeed the world's strongest production padlock. It is usually supplied with the high-security R1 restricted key profile (except when matching a previously-supplied alternative profile lock via the Keyed-Alike option). Please note: This is an ultra heavy duty lock that weighs 2.2kg! Not recommended except for extreme situations where the ultimate deterrent is required.